This is a rare 1886 example of C. Graf's map of the United States of America. The map covers the eastern part of the United States from eastern Texas to the Atlantic, extending northward as far as Lake Superior, and southward to the Florida Keys. 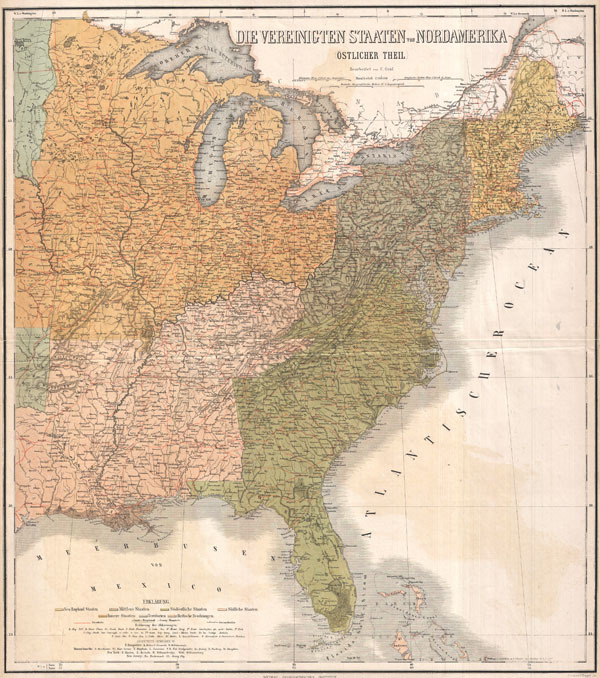 The various states are segmented into unusual color coded zones including New England, the Middle States, the Southeastern States, the Southern States, the Inner States, the Territories, and with regard to Canada, the British Possessions. This map first appeared around 1870 and went through several editions – this being the latest and the least common. Drawn by C. Graf and published by the Geographisches Institut of Weimar as plate no. 62 in the Hand-Atlas des Himmels und der Erde. Graf, C., Hand-Atlas des Himmels und der Erde, (Geographisches Institut, Weimar) 1886.